Little Black Lies has won the Dead Good Linwood Barclay award for the most surprising twist. 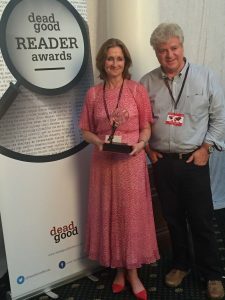 Voted by readers and in their second year, these popular awards were presented at the Theakston’s Old Peculier Crime Writing Festival in Harrogate in July, at a ceremony presided by Mark Lawson. Other winners included Stuart Macbride, Robert Galbraith and Peter James.